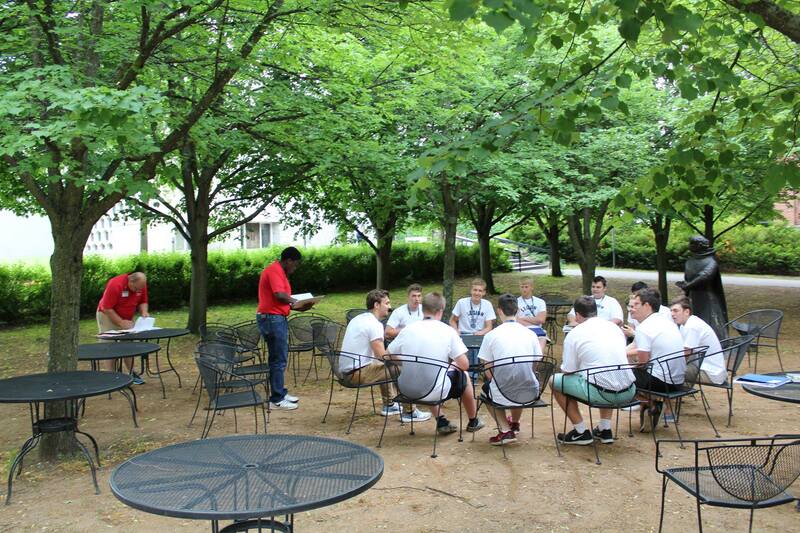 Getting down to business: Local participants at Boys State hit the ground running with the election of mayors, council members, and delegates, along with learning the political ropes. MARSHALL - American Legion Boys State is a unique, life-changing experience, organizers and participants said Tuesday at Southwest Minnesota State University, where the attendees got more and more immersed into the mock political process. After gaining valuable insight at four schools of instruction Monday - on Parliamentary Procedure, Local Government, the Legislature Process and Political Party Organization - the Boys Staters began to convert that knowledge into action Tuesday, beginning with city caucuses. "Government has always kind of interested me, and this just puts it into practice," Marshall High School senior Nick Evans said. "To actually be part of it is just really awesome." Evans, who was elected to the Austin City Council, is one of 10 delegates to the county convention, which also took place Tuesday. "We all work pretty well together," Evans said. "We've been able to get a lot done. We divided into our parties (Nationalists and Federalists) this morning. I'm a Nationalist." From the county convention, 12 delegates and 12 alternates were chosen for the state convention. "You're elected at the county level and kind of move up," Evans said. "It's been a lot of fun. I'm going to run for the House of Representatives next. We file for office (Tuesday night)." The most prestigious position elected so far is the mayor for each of the 12 mock cities. "This is like a brand new Christmas present of everything they ever wanted all wrapped up in one and they got it," said Mike Bredeck, Minnesota Boys State program director. Canby's Bill Longhenry was elected as mayor of Duluth. "(Monday night), they came in and announced that I won it for mayor," Longhenry said. "That was a pretty proud moment for me." Longhenry, along with other elected mayors Sylesh Volla (Anoka), Brendon dos Santos (Austin), Cody Hollerich (Hibbing), Levi Carstensen (Mankato), Kyle Batholomay (Minneapolis), Zac McFarland (Moorhead), Adam Anderson (Rochester), Preston Peterson (St. Cloud), Alex Cheng (St. Paul), Don Raleigh (St. Peter) and Michael McCarthy (Winona), didn't have much time to savor their victories. They immediately got to work. "We've been having a couple different city meetings, and I feel like I've been doing a good job," Longhenry said. "I've been talking to my fellow Boys Staters and they say I'm doing a pretty good job as well." At the city convention, residents of Duluth had to decide whether they wanted a weak mayor or a strong mayor system. "Before I even said anything, a bunch of people jumped up and said strong mayor," Longhenry said. "I said it's whatever you decide." With a weak mayor, everyone has a vote and the same amount of power. The downside, Longhenry said, is that the system sometimes lacks leadership. "When there is a strong mayor versus a weak mayor, there'll be somebody more in charge," he said. "Things work better when there is more of a leader." With a strong mayor, everyone gets a say, but ultimately, it's the mayor who makes the decision. The process can be severely flawed if the mayor doesn't have the best interest of the city at heart. But Longhenry doesn't see that happening in Duluth. "I'm not going to run against my own people," he said. "I'm going to work with them." As a city official, Longhenry said he'd try to see everyone else's viewpoint before offering up his own. "I can acknowledge their vote, but in the end, I have to say whether or not I think it should pass," Longhenry said. "But I think we work well together. Everyone here does a good job." At the county level, Longhenry said he received nominations for a new position but turned it down. He does have aspirations of running for a Senate position or possibly even Boys State governor if things align in his favor. "I'd rather be on a smaller scale and know people on a person level," he said. "I like meeting people and knowing the personality of a person. I want to meet people and not just see a list of people." With all 12 city representatives present at a mayors conference Tuesday, Bredeck and Jim Tate, SMSU communications director, congratulated the newly elected officials. "There's really a feeling of camaraderie this year," Tate said. "This is just a good group. And this can change your life." Tate asked the mayors if it had changed any of their lives yet, and more than half responded that it had. "And, it's only been two days," Tate added.